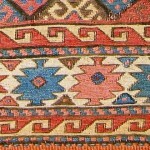 If you read my first, tentative post about carpet motifs, you may remember that I promised a follow-up dedicated exclusively to border motifs. My attempt at compiling a comprehensive glossary of border motifs, however, very quickly ran into a wall. There are countless border motifs out there in that jungle that is the world of oriental carpets, and many of them have multiple interpretations and variants. No wonder that no-one has bothered to publish a simple, helpful compendium of border patterns. It would be a mind-boggling and thankless task. Out of the galaxy of border motifs that can be found in oriental rugs, I have chosen just a few, because they are either common and worth knowing, or because they are simply cool to look at. This short list, therefore, is not by any means exhaustive. It is just a beginning, an elementary text to jump-start your own motif-hunting expedition.